Webster University’s Gretchen Rieger practices her form at Maplewood-Richmond Heights High School on April 18. 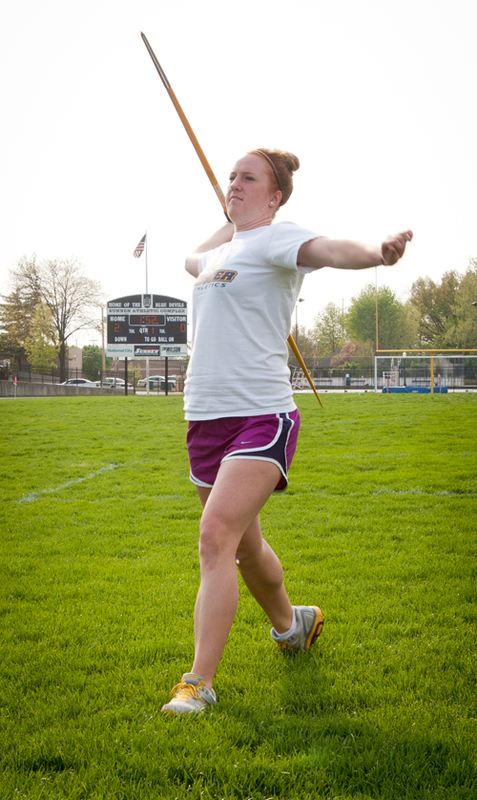 Rieger broke the Webster record for the javelin throw in her first collegiate meet on March 19. Even though Webster University junior Gretchen Rieger is a record-setting javelin thrower on the women’s track and field team and a starting outside hitter on the volleyball team, she is not just a two-sport star. She is a special education major who has already dedicated to help today’s youth by participating in the UrbanFUTURE tutoring program. Rieger stunned Webster coaches and teammates when, in her first collegiate javelin throw, she shattered the Webster school record with a throw of 38.94 meters. Rieger’s toss was good enough to win the event at the Rose-Hulman Early Bird on March 19. Track and field coach Dusty Lopez said having a great performance early in the year can make the remainder of the season more difficult. “In a few seconds you go from no pressure and no concrete expectations to all of the sudden feeling like you’re on the verge of something big, and you have to live up to it or improve on it,” Lopez said. Rieger, who attended Lincoln College last year, takes on 19 credit hours and works part-time for the university in addition to being a two-sport athlete. But she still finds time to help others. As part of the UrbanFUTURE program, she tutors a student at Froebel Elementary School. Even though Rieger fulfilled her UrbanFUTURE tutoring commitment last winter, she made arrangements to continue tutoring because she felt was making progress with the student she was working with. Putting in the additional time required Rieger to adjust her schedule. She said it’s a combination of managing her time and setting priorities. Rieger was originally recruited to play volleyball at Webster, and said she had no thoughts of competing in track and field. She took up the javelin to stay in shape during the volleyball team’s offseason, she said. At her community college, Rieger was a standout volleyball player and qualified for nationals in the javelin throw. She finished 15th in a field of 20 participants in the javelin throw at the national meet. Lopez said it takes a special type of person to keep all of the commitments that Rieger does. The women’s track and field team participated in the Rose-Hulman Twilight meet on April 15 in Terre Haute, Indiana. Rieger finished first in the women’s javelin throw. Her throw of 36.93 meters was not her best of the season, but it still topped the 17 other throwers in the competition. McQueary said Rieger is settling down and focusing more. As the track and field teams wind down their seasons, Rieger said she thinks the program is moving in the right direction. Countless school and personal records have been set this year. Both track teams will have an opportunity to continue shattering records when they participate in the Dewey Allgood Invitational on April 23 in Rolla. The teams finish the regular season at the Illinois College Twilight (SLIAC Invitational) on April 30 in Jacksonville. Lopez said Rieger’s quiet, serious approach at practices and meets has helped her earn success this season.